Tower-based desktops aren't as popular as they once were, now that many shoppers favor mobility and compact design over the traditional desktop benefits of power and easy upgradability. One big exception: all-in-one PCs. The sleek desktop system has found a place away from office desks at the center of home and family life, as communication hubs and media centers. At this year's CES, we're seeing some interesting innovations in the all-in-one computer category with the potential to shake things up as thoroughly as tablets did a few years ago. 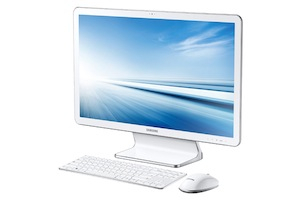 Samsung's new AIO, the $1,299 ATIV One 7 2014 Edition, looks pretty standard at first sight: a 24-inch full HD touch display, fourth-generation Intel Core i3 and i5 CPU, Windows 8.1 and HDMI-in for connecting cable/set-top boxes or gaming consoles. Since all-in-ones often end up being used as media hubs, Samsung is taking this to the next logical step. The ATIV One 7's 1TB drive offers plenty of space for storing music, video and images — so much that you can use it as a media server and personal cloud via Samsung Link, which gives you remote access to files on the AIO wherever you are. You don't have to leave it on 24/7 for this to work, either. Link can remotely power on the ATIV One 7 when you want to stream or download a file. Another great media feature is BT Music Play 2.0, which makes it possible to stream audio to the stereo speakers embedded in the all-in-one from a smartphone, tablet or other Bluetooth-enabled device. The PC doesn't have to be on for this to work, so you save energy. With the ATIV, you won't need a separate Bluetooth speaker dock. Even better, the aptX audio technology doesn't compress streamed music as much as normal Bluetooth, resulting in richer, fuller sound without a physical connection. All-in-ones that act as the family's main computer for both work and entertainment are well served by Windows 8. But if the machine is meant more for playing casual games, watching video or surfing the web, Microsoft's pricey operating system isn't a necessity. 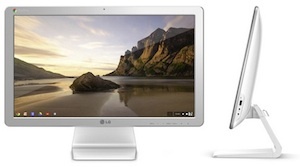 Consider the LG Chromebase, a 21.5-inch AIO that runs on Chrome OS, Google's browser-based operating system. While there are some drawbacks to using this OS on a laptop, since it requires the web for full functionality yet wireless connectivity isn't always available, that's not an issue for a desktop computer. The Chromebase is expected to be less expensive than most Windows-based all-in-ones, but no price as been announced yet. Chrome OS utilizes web apps, not local ones, so the Haswell generation Intel Celeron processor, 2GB of RAM and 16GB of SSD storage should be robust enough. The most expensive component is likely the 1080p IPS display. Unfortunately, this doesn't appear to be a touchscreen — arguably unnecessary for an OS that is all about the web, which isn't always touch-friendly. Touch comes naturally to Google's other operating system, Android, which is normally found on smartphones and tablets. 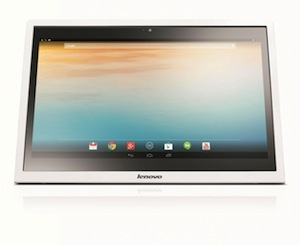 Both Lenovo and Acer just announced Android-based all-in-ones, though the machines themselves are designed for very different audiences. Lenovo's 19.5-inch N308 could be seen as a very big tablet, since it includes a battery good for three hours of away-from-the-outlet use. Since most people wouldn't want to watch TV with a huge tablet in their lap, it's probably more useful to think of the N308 as an easily movable all-in-one. Move it from the living room to the kitchen to the bedroom to the rec room, depending on your needs; you don't always need to move the cord with it. The N308 is comparatively inexpensive ($450) even though it runs on a powerful Nvidia Tegra chip and includes a touchscreen. The 1600 x 900 resolution isn't as impressive as other AIOs on the market or even some 10-inch tablets — a trade-off to keep the price down. 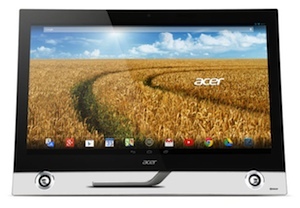 On the other end of the spectrum is the $1,099 Acer TA272, a 27-inch AIO with a high 2560 x 1440 pixel resolution. Android 4.2 and a quad-core Nvidia Tegra chip run the show here as well, though 16GB of RAM indicates that the TA272 is meant to be a serious machine. It'll be hard to find an Android game that won't run on this, no matter how complex, and high-definition video should be smooth as butter. Like the Samsung ATIV One 7, Acer's all-in-one is also meant to be used as a media server and cloud storage machine via the Build Your Own Cloud service. With both HDMI and DisplayPort inputs, the TA272 can act as a monitor for a Mac or PC, letting you switch between a work OS and a more play-oriented OS easily, without having to change devices. Android is well suited to drive a large screen media center, thanks to thousands of available music, video and game apps and a ton of content behind them. The N308 runs on Android Jelly Bean version 4.2, which allows for multiple profiles, making it a potentially good family computing hub. And though Android's productivity apps aren't as robust as those available for Windows, you can still get good work done on this type of machine. The biggest hurdle will likely be the differences in negotiating the Android interface versus Windows, especially using a keyboard and mouse. This new generation of all-in-ones will hit store shelves over the next three months. The Samsung ATIV One 7 is coming in May, the LG Chromebase is available in the Spring, Lenovo's N308 comes to us in February, and Acer's TA272 is already available.